Vibration issues can be some of the hardest to detect. You have had a new set of tyres, the wheels have been standard balanced, but still there is still a vibration. All tyres have some differences in uniformity in the stiffness of the sidewall and/or footprint due to the variables in the manufacturing process. So when a tyre rolls on the road, it flexes (as if made of springs) and when the tyre rolls onto a stiffer section of the tyre, a lump or bump gives a vibration input. It is this irregularity or Road Force Variation (RFV) that causes the vibration. How can I get a smoother ride? For new cars, tyre uniformity is measured in assembly plants and manufacturing facilities, where they ensure the wheel and tyre assemblies are matched to provide the smoothest of ride for that ‘new vehicle feel’. However, on the high street you won’t find the same multi million pound tyre uniformity machine, but here at BalanceMyCar you can find your nearest workshop with a specialist Hunter Road Force Balancer. This Road Force Balancer uses a ‘Road Roller’ to perform a computer simulated road test, isolating and measuring the exact cause of wheel-related vibration. 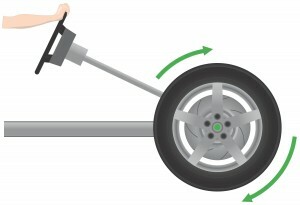 Using the roller it can then measure the RFV and provides a solution to resolve the issues, by matching the stiff spot of the tyre to the low spot on the rim. It is such a quick and accurate system, that many Motor and Tyre manufacturers audit teams use it. It is the ‘only’ system of its kind that is currently available in the retail sector. If it’s not a Hunter with a load roller, it is highly unlikely to be able to perform a Road Force Balance!